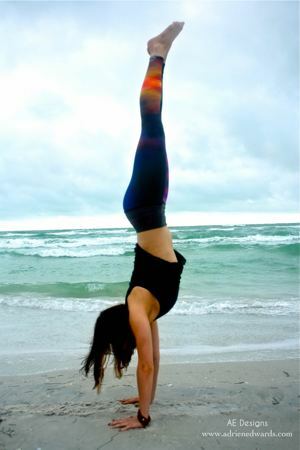 Erin is a yoga teacher & writer and a self-proclaimed "real food" activist. A red wine and French cheese loving bad yogi based in Tampa Bay, she teaches vinyasa flow and aims to keep her classes fun and accessible. You won’t hear much Sanskrit but you’ll probably get plenty of corny jokes, lots of core work, and sweet, delicious deep stretches. She's a firm believer that yoga doesn't have to be complex: if it makes you feel good, you're doing something right. Erin is the legendary 30-Day Yoga Challenge teacher and The Bad Yogi columnist on DoYOuYoga.com. She is also a regular contributor for YOGANONYMOUS, MindBodyGreen, and the Huffington Post. Favorite yoga style: I know the crazy hard poses are trendy now, but I love really slow, expansive stuff. I think eye pillows, bolsters and blankets are totally underrated! Though I have equal love for powerful vinyasa classes too. It depends on the day, really! Favorite yoga pose: Kneeling lunge, supine twists, & crow because it's super cute! I feel like crow should have a sound effect or something, lol! Yoga is... a lot of things! For me, it's three: (1.) an expression, just like any other art (2.) a way to communicate with yourself, and not in a literal way necessarily, but in how you treat your body when you practice. Whether you push yourself too hard, or not enough, it will tell you how it feels about it (3.) Teaching yoga has been one of my life's greatest pleasures; I practice to feed my teaching, but I teach to feed my life. Even when you're in it for the physical benefits, the challenge of it starts to show you things about who you are and how you tick: how you respond to bumps in the road or plateaus that seem never-ending, how you confront fear, where you're weak, where you're strong and sometimes what you thought you knew about yourself but really didn't. It's exciting and motivating and humbling all at the same time. And besides all that, it's super fun. I can't say that it's changed my life or personality. I've been doing yoga since I was 16, so I barely had a personality before I started practicing, haha. Honestly, I don't totally remember all the little gritty details of myself before it. I just sort of grew with it, I guess, and it gave me my purpose when I started teaching. Physically, it has definitely made me stronger, more flexible and it REALLY improved my posture. Maybe it isn't a "thing" to get better at, but I know it's definitely made me more confident in myself. I guess there's something to feeling strong and balanced in your own body that translates everywhere else too. Studying. I do a lot of yoga by myself and I study a lot of anatomy. There are plenty of things I still can't do physically, so keeping things interesting and challenging is pretty easy! Leslie Kaminoff is a huge inspiration to me. Apart from his teachings (which are fantastic), I love that he's kind of a renegade in that he's an atheist, non-mystical, practical guide. He is who he is, unapologetically, and I love seeing authenticity in someone in the yoga community. I'm inspired by the human body. I'm obsessed with the anatomy of yoga and how we can make our bodies work better for us and make our yoga more than an exercise class (which is what it is in a lot of studios these days). I also gain a lot from Dice Ida Klein, Tiffany Cruikshank, music, and the awesome people in my classes. I'm paraphrasing, but the best advice I've gotten is to let go of the fear of embarrassment and failure. If you're constantly afraid of making a mistake or that people will judge you or think you're weird or stupid, and you base your actions on those things alone, you'll only get as far as everyone else's acceptable standard. In order to grow and progress, you have to go out on a limb. And why not go way out? I think a lot of people are intimidated by yoga because so many of its practitioners claim to have such a deep, practically romantic relationship with it. People come to yoga thinking every class to be a profoundly spiritual, mind-blowing experience, and that it will "fix" us of all our deep-seeded imperfections. The truth is, a lot of times, while pleasant, yoga is routine and decidedly un-majestic. But as long as you keep showing up with an open mind and let go of your gigantic expectations, those little magical moments will show themselves to you. When you're in Savasana and you feel your ribs moving against the ground as you breathe… that's the good stuff. Have you joined Erin's free 30-Day Yoga Challenge yet?